In the early days of my website, back in 2001 and beyond, the number of photographs I was able to upload was very limited, due to the very small amount of storage space I originally had on the internet. Now that I have a lot more, in the same way as with 1986 and 1987, I have now scanned in most of the photos I took on my third visit to Le Mans in 1988 and have included the full story that I recorded at the time..... The scans are from photos that are now nearly 26 years old, so aren't perhaps as 'crisp' as we would hope for nowadays! By the time plans came to be made for Le Mans 1988, quite a lot had happened to me since my trip to Le Mans the previous year. I was now a married man, with a ready-made family! Toby was all of 3 years old by this time, and we had a new family home (since March) in Lymington, in the New Forest. As you might imagine, these events amounted to a major upheaval in my way of life, and it was inevitable that my regular racing days would have to come to an end. Notwithstanding this, I was of course delighted with this quite marvelous turn of events. As usual, the plan was for the team members to meet up at Ian's for coffee before leaving for Portsmouth. All except Robert and Dave duly arrived, and we waited and waited and waited! Eventually five of us set off for Portsmouth, leaving Richard behind to wait for Robert with the other ferry ticket. We arrived at Portsmouth and joined the first queue at the ferry terminal, but there was still no sign of Robert. At this stage, yours truly realised that, we had a problem. The ferry ticket was for the car and four passengers only! (The intention, of course, being to have four of us in each of the two cars). Martin therefore resolved the problem by purchasing a ticket as a foot passenger! We were shortly moved onto the ferry, and there was still no sign of Robert. Our car was positioned quite near to the rear doors of the ferry, and we could clearly see that there were very few spaces left! These were gradually taken up, one by one, until there was only one space left. You've guessed it, at this very moment, Robert arrived, with Dave and Richard, and bagged the very last spot on the ferry. Talk about cutting it fine! 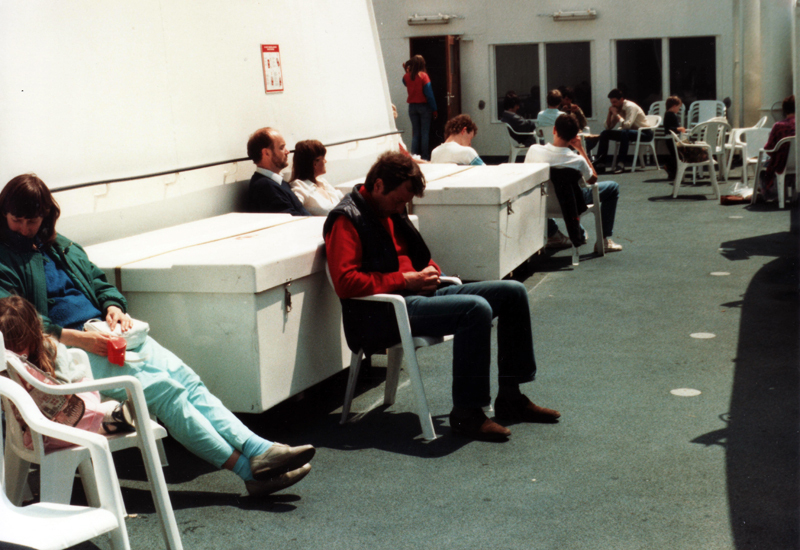 The ferry crossing in 1988 was a new one for me. Instead of Cherbourg, we went via Caen (Ouistreham). Over the years, I have made the trip to Caen on a number of occasions, and while the open sea generally looks the same from whichever angle, the port itself is far more picturesque than say, Le Havre or Cherbourg. It has become my favourite of all of the channel crossings we have used. Having said that, as with the majority of the ferry crossings, there was nothing remarkable about this one. 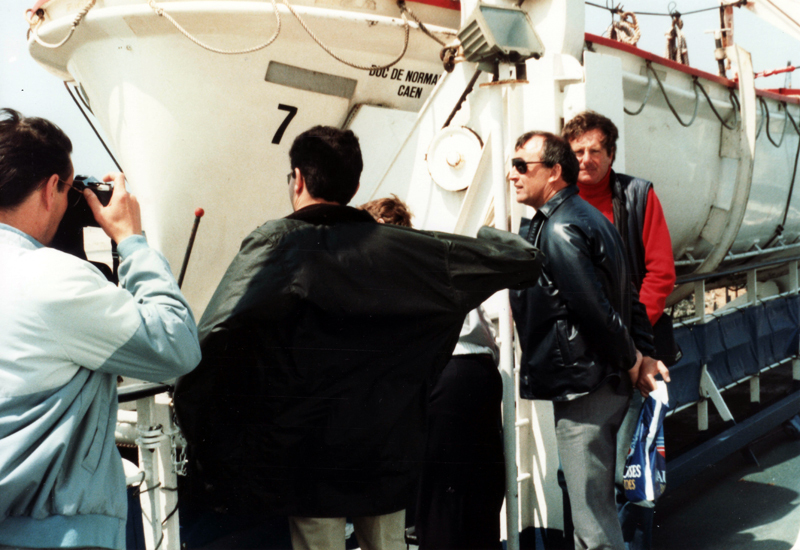 I do recall that we had lunch on board, and thus it must have been a relatively early start in 1988. Arrival at Caen is an unusual experience. The entry to the port is rather different to the other French channel ports, in that the approach is by way of a relatively narrow channel, which gives the impression of travelling along a wide river, with sandy beach at both sides. The "river" then gives way to a harbour in which the ship is turned before docking. We left the ship, this time with Martin safely installed in one of the cars, and headed off for our evening stop. I haven't mentioned cars as yet, but I think I am correct in saying that Ian drove a 528i (old shape), whilst Robert had just taken delivery of a brand new, new-shape 535i, which drew a lot of admiring glances, not only on the way to Le Mans, but at the circuit itself. The weather was absolutely beautiful and it was sufficiently hot to require us to make a watering stop at a roadside cafe for cold drinks on the way to Domfront, which was to be our Friday evening port of call. We suffered a few problems with navigation on the way to the Hotel de la Poste in Domfront that afternoon, which were compounded by roadworks and diversions each way we turned. It was quite amusing because we were followed for part of the way by an Austin Healey, the driver of which clearly thought that we knew where we were going so he followed us! We finally arrived in Domfront in the early evening, in the middle of a bicycle race, another of the great French sporting passions. A glass of pastis at a table outside a roadside bar brought a cool and civilised end to the afternoon, and we readied ourselves for dinner. I remember dinner at the Hotel quite well as a result of one particular dish. I couldn't tell you what it was exactly, but it was an entree, rather than a main course, consisting of white fish in a mild curried sauce. It sounds quite atrocious, but it was delicious and I could have eaten it several times over, and I remember it well to this day. Sadly, I haven't encountered the dish since! After an excellent meal, sleep came easily that night, the only problem for Martin and myself being that the room we were sharing had a very large, regularly flashing, red Hotel de la Poste neon sign outside! Morning came and as usual, I was up and about fairly early. A refreshing bath was soon followed by a bracing walk around Domfront and into the ruins of a castle, up above the town. After a while, the others surfaced, and Robert decided that he simply had to buy himself a decent shirt (as I recall, for the price of at least one arm and one leg). We then made for the cars and the journey to the circuit. We broke the journey for lunch at the Hotel de Paris at Cilez, where it was a case of horse steaks and frites for everyone. Although the menu didn't describe the meat as such, it was obvious to those of us in the know that the meat was of the equine variety! As I recall, Douglas was just a little upset when he found out, particularly when the van selling the meat, clearly signed to the effect that it was horse-meat, pulled up outside the restaurant! I'm fairly sure that 1988 was the year that we purchased a car park ticket on the quay at Portsmouth. It seemed like a good idea at the time, as it would avoid the need to stop on route to the track to buy the garage ticket. The only problem was that the ticket was for the vert (green) garage, whereas the garage rouge (red) was our customary destination. We didn't appreciate the full extent of our mistake until we actually arrived at the circuit, and tried to find the green car park! Eventually, we ended up entering the circuit somewhere around Tertre Rouge, and travelling beneath the track to a large, rather remote parking area inside the circuit. As a result of the delay in getting parked, we were running very close indeed to the start of the race when we finally purchased our encientes generales and made our way in. This will, I trust, explain why the first of my photographs at the circuit show the cars already racing at the Esses. We simply didn't have time to fight our way around to the main start/finish straight as we normally would. (A blessing in disguise, as far as I was concerned!). So the start of Le Mans 1988 was watched from the area of the fairground, i.e. the drag downhill to the Esses, and on down towards Tertre Rouge.